Vivian and I have been going out to our little patch of wilderness everyday, for a while now. “Wilderness” makes it sound more exotic than it is–it’s just a plot of land at the edge of the city with a graveled walking path and loads of spindly poplars, but it’s got personality. (Kind of like a shy person at a party who you learn to appreciate only after spending more time together.) Some people call it the flats; we call it the Prairie of Prax in a nod to one of my favourite Seuss stories. I love it for many reasons: the cemetery on the hill buttressing its northeast corner, the still-standing fort Susanna and Belén made years ago, the wild saskatoons, the way the sky opens up so I can watch weather roll in from the west or birds flying south, the sound the wind makes through the grass, and its curving trails. Today Vivi and I suit up to make our daily pilgrimage in the rain and just-above-freezing wind. Once we pass the manicured lawns and reach the trail flanked by tall grass, cattails, and hardy scrub, I’m happy to be out. We round a corner skirting a thousand papery wind chimes, otherwise known as trembling aspen, and I look for the nest I spotted yesterday. I’d wanted to take it home for Vivi’s nursery but then decided to leave it alone. Today I’m glad I did; it’s nice to have one more familiar landmark in our journey. It feels vaguely obsessive compulsive to walk the same direction, anticipate the same curves, and look for the same markers each day, but that is what ritual is all about I suppose. Even following my stroller tracks from the day before makes the whole trip feel more comfy and reassuring. Like home. When I see a figure up ahead I’m not entirely surprised but still interested. (I often have the two miles to myself–another reason it feels like home.) It appears to be woman with a pail swinging in her hand. Could she be gathering something? I thought I was the only one who did that here. Now she leaves the trail and steps high through grass brushing against her thighs. I push my stroller just a little faster so I can reach her before she disappears into the trees. “Hello!” I call out, even though she’s not looking my direction. She seems awfully determined and I wonder if she’s feeling territorial about her booty. “Hi there,” I say again with a smile. This time I’m so close it will be plain rude if she doesn’t return my greeting. “No espeak inglesh,” she says turning to face me. She looks about sixtyish and is wearing bright red lipstick to match her dyed hair. I try to look friendly and edge in closer to get a look at what’s in her bucket. “What are you picking?” I ask her in my most non-threatening tone. By this time Vivian is starting to wake up but I’m not ready to move on. I’ve caught a glimpse of what’s inside her pail and want to learn more. “Mushrooms! What kind are they?” I don’t know much about edible mushrooms but they look different than anything I’d pick. “I Ukrainia,” she says, shrugging her shoulders. She tilts her pail toward me and rolls the fungi back and forth, caressing them with her hand. And then, from within the crackling, snapping brush comes another emphatic “No espeak inglesh!” from her partner. I can’t tell if this is supposed to be a kindly explanation or more of a warning, like, don’t even think of stealing our spot. If Vivi weren’t whimpering, or if I could speak Ukrainian, I might try to get more out of her, but we’ve clearly come to the end of our socially awkward situation. I lean into the wind, and start pushing the stroller while the woman waves, points at us, and gestures like she’s rocking a baby. I can’t tell if she’s amused, confused or just wants to get rid of me. Either way, I continue on. The rain has stopped and I’m getting warmer now. The poplars, with their turning leaves, are like slices of ripe mango laid on a plate of bright blue sky. Nearing a pond I see a flock of Canada Geese winging a graceful descent to the water. Further along the way ruby-red rosehips decorate bushes at the edge of the path. They’re plump and impossible to resist so I give the stroller a shove to keep Vivi moving forward while I quickly pocket a few. I’ll make tea from them later. I may not have dibs on mushroom hunting grounds, or even know how to harvest them, but it doesn’t matter. I’ve got ingredients for prairie chai and some stroller tracks to lead me home. 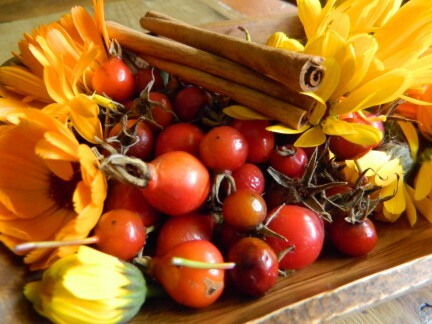 Calendula (from my garden), rosehips (from the Prairie of Prax), and cinnamon sticks (from Superstore). I steep these together, add some honey and milk, and feel like a rich person. Decoction: A concentrated tea made by boiling, then steeping botanicals for a period of time. Usually decoctions are made with tough plant parts, like root and bark, to ensure plant compounds are extracted into the water. Belén and Susanna are heading to their school’s annual cross-country meet this morning. The day before yesterday, Belén came hope with her nose plugged up tight and complained about not feeling well. Since Belén has been looking forward to this long-distance race all year, I tried my best to come up with a cure. This tea, besides sleep and a chest/back rub-down with herbal salve, was the third component of my home remedy. 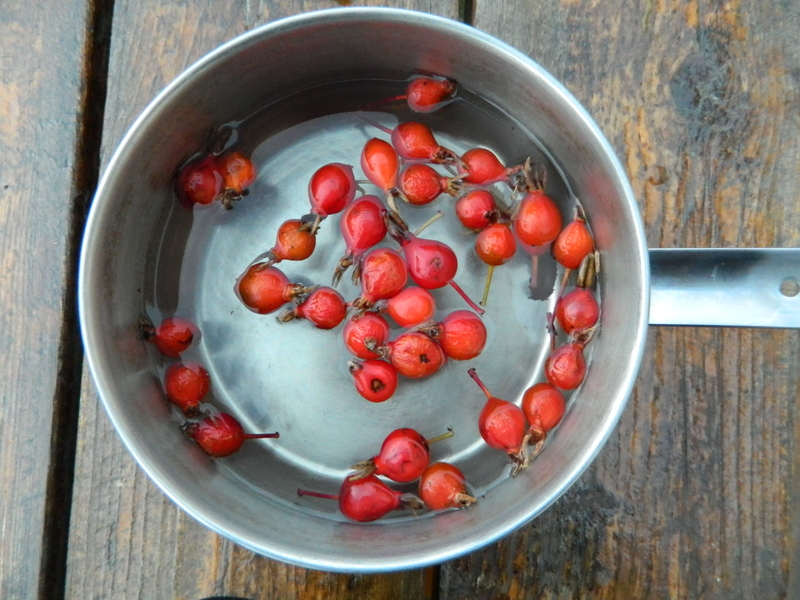 Boil rosehips in water for about 2o minutes. Once the water boils, keep covered and simmer. Turn heat off and let rosehips steep for five minutes, or up to 12 hours. I gave Belén a half cup to drink before bed, which she downed easily, and then another half cup the next morning. The morning cup was not tolerated nearly as well as the cup the night before, even though I sweetened both drinks with a generous amount of honey. Steeping the hips all night makes the drink much more potent and strong tasting. 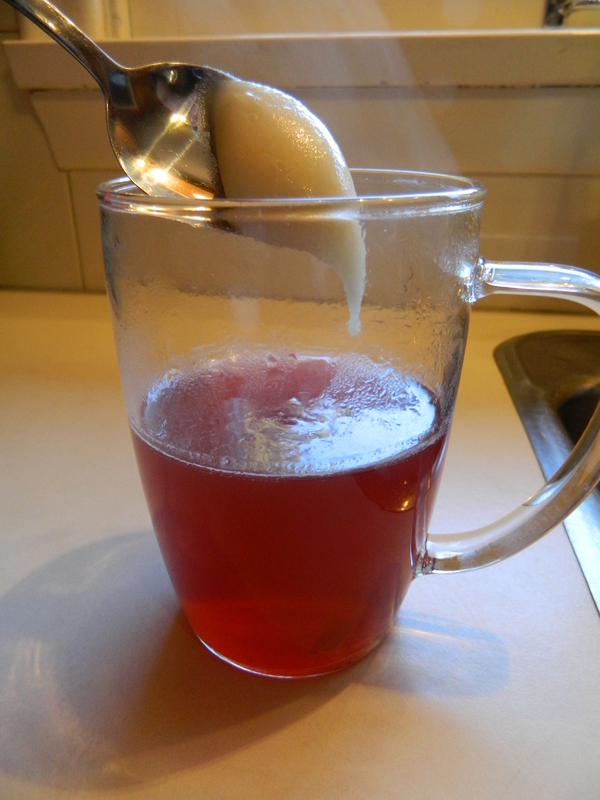 A steaming rosehip decoction with some honey. This is the stuff I left steeping overnight. Rosehips contain vitamins A,B, E and K and are one of the best natural sources of vitamin C; they are effective for cold and flu prevention and treatment. Interestingly, they are also anti-spasmodic (prevent spasms and cramps), anti-bacterial, high in iron and other minerals, and contain bioflavonoids contributing to heart health. Some sources claim rosehip tea works as well as cranberry juice for dealing with urinary tract infections. 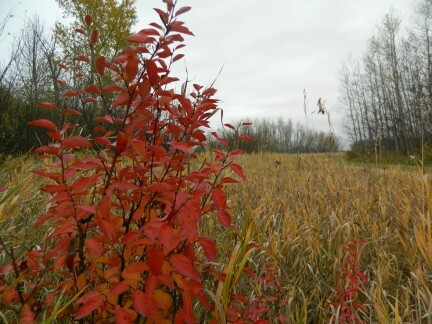 Here’s to rose hips and running! PS. Just writing that last line makes me feel active and healthy. I like wearing my running tights around the house (if not actually running in them), and I enjoy the rosehip tea— I think that must count for something.